Simultaneous Voice and Data. Being a CDMA phone, this product will not make calls and consume data at the same time. I really thought this was a deal breaker; perhaps it was for a while. 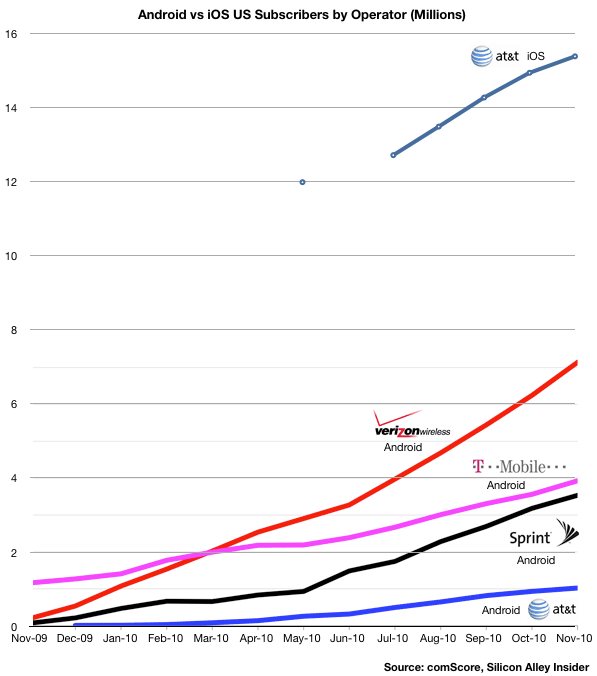 But the Android onslaught, combined with the “not here yet” status of LTE, likely forced Apple’s hand. According to this chart from Horace Dediu, iOS subscriptions on AT&T are plateauing. Apple needed to move. Get ready for AT&T to pound this difference in its iPhone ads. iPhone either works the same on Verizon as it does everywhere else, or not at all. We want the experience to be the same for every iPhone user. Verizon’s FAQ set off shovelware worries Tuesday morning, but we’ve since learned that the Mobile Hotspot feature is simply a carrier-specific setting in the Settings app. You’d better believe Verizon wanted to vandalize the home screen. Apple, unsurprisingly, won that round. The App Store is another interesting wrinkle. Verizon almost certainly wants a say in app approval — many assume AT&T has had such influence over the years — but the last thing Apple wants is for certain apps to only be available on one carrier. This was probably a point of contention leading up to the deal, but it’s likely been resolved now. Retail. The retail problem I cited is solvable, and Apple has had a long time to think about it. Ultimately, it was just time to end the wait. Branding. The only Verizon logo you’ll be seeing on this phone is in the status bar, where “AT&T” used to be, in non-italic Helvetica Neue. They couldn’t even get their signature V up there, and I bet they’re pissed. This whole development is, without question, big for both companies. Some people were surprised by Steve Jobs’ absence; if those people can recall the last time Jobs took second stage at someone else’s press event, I’m all ears. But Apple did just about everything short of that by sending Tim Cook and Phil Schiller to New York. This isn’t a new product, but it is still a very big deal to Apple. There’s already plenty of fallout and speculation: Where are the plan prices? Where’s the iPad? Will the next iPhone show up at the same time on Verizon as on AT&T? What interests me the most is that we now have a straight up carrier war on our hands: the same exact product on two rival networks. This is decidedly different than the Android model, which has flooded the market with different phones, running different software, tied to different providers. You can’t get a Nexus S, or a Droid Pro, or HTC Evo on your choice of carrier. AT&T and Verizon now get to compete, apples to apples (pardon the pun), for real. How many “upgrade eligibility” and cancellation fee tricks will come out of the woodwork now that a true threat of abandonment exists on both sides? How will Apple walk the tightrope of integration requests from each partner? How nasty are these commercials going to get?